Barcrest, the slot manufacturer which was bought up by global gaming business Scientific Games in 2015, has a handful of games that are very well known. The filthy rich Monty’s Millions slot is one of them, so is the casino-themed game Ca$hino. However, by far the most popular slot in their impressive portfolio is Rainbow Riches. This simple, 5 reel, Irish-themed slot has been pulling in the punters in both land-based casinos and online casino for decades now. So wide is its notoriety that Barcrest regularly re-hash the original Rainbow Riches game, slap a new name on it and roll it out to the public. Which begs the question, is Rainbow Riches Pick ‘n' Mix any different to other versions? It is probably fair to assume that the development team at Barcrest are very cautious of changing anything when it comes to Rainbow Riches. The old-adage ‘if it ain’t broke, don’t fix it’ springs to mind and it certainly feels that this is the mentality with this slot game brand. The base game in Rainbow Riches Pick ‘n’ Mix is very much your standard Rainbow Riches slot. The standard K-Q-J-10 symbols share the reels with the lucky leprechaun, stacked Rainbow Riches symbol and Wilds. Not the most exciting selection and the stacked Rainbow Riches symbols just drive me mad as they block nice wins by splitting the reels. Just the 5 bonus rounds to choose from! Free Spins Bonus – Land 3 or more bonus symbols on reels 1, 3 and 5 and you will be rewarded with between 10 – 30 free spins. Wilds symbols can also replace Free Spins scatters and the feature can retrigger, but only once. Pots of Gold bonus – This feature is triggered when you land 3 Pots of Gold symbols together. You will then be presented with a number of spinning pots, which will be either bronze, silver or gold. You choose when to stop it spinning and the arrow points to your prize. Up to 500x your bet available. Road to Riches bonus – Most Rainbow Riches fans will know this one. Land 3 or more of the Leprechaun scatter symbol and you will activate the Road to Riches bonus. Spin the wheel and advance along the road, collecting wins along the way. 500x your stake is available again in this feature. Cash Drop bonus – This feature will be triggered with 3 or more Cash Drop symbols. You will then be presented with a 10x5 grid of gold coins. The coins spin to reveal either a blank or a multipler, which are totalled and added to a win meter. You then get a chance to collect or continue with the possibility of greater rewards available. If you make it to the third round then you will win whatever is shown in the meter after the coins have spun and all the multipliers are added up. Magic Toadstool bonus – Get 3 or more toadstool symbols appearing and you will trigger the Magic Toadstool bonus. Pick 3 toadstools from a field of 24 and you will either uncover a multiplier or a fairy. The multiplier can increase your win, but the fairy may allow you to keep picking toadstools and increase your chances of further multipliers. The bonus features also have a Super bonus element when you land 4 scatters. This increases your chances of winning a bigger prize basically. This unusual feature allows you to wager in a different way. By selecting the ‘BB’ purple button you then go through to a new screen where 1 – 3 dials can be found. You stake between 10 – 25 coins and have the chance to either play the bonus feature immediately or get 5 spins. 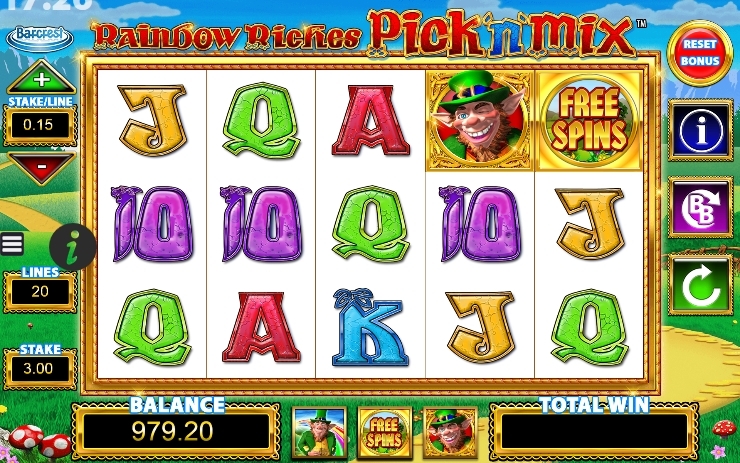 It’s an interesting feature, which is probably the most original part of this Rainbow Riches slot. A game designed to appeal to the armies of Rainbow Riches fans out there, with lots of the typical graphics, sound and features that make this game so widely appealing. For those that love this branded game, they will find features that they thought had been put out to pasture, so that might be an added benefit. The only thing I really noticed any different in Rainbow Riches Pick ‘n’ Mix was the ‘Big Bet’ feature, which offered something new for the more bonus-orientated players out there. 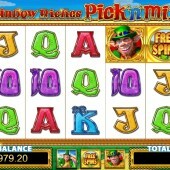 Overall though, there is nothing ground-breaking here, it’s very much a typical Rainbow Riches slot game.